"Harvey delays opening of many Texas schools; some become shelters" was first published by The Texas Tribune, a nonprofit, nonpartisan media organization that informs Texans — and engages with them — about public policy, politics, government and statewide issues. Editor's note: This story has been updated to note that Houston ISD has gotten approval to provide its students with three free meals a day for the 2017-18 school year. Last Thursday, Superintendent Wanda Bamberg honored Aldine ISD students who took extra classes this summer to graduate. The next morning, she and her teachers were putting library books on higher shelves, where they would be less likely to be inundated by flooding. "We were celebrating for the kids Thursday and then trying to protect the rest of them on Friday," she said. Instead of overseeing the Houston-area school district this week, Bamberg is helping oversee relief efforts at two Aldine ISD buildings being used to shelter evacuees as Hurricane Harvey continues to flood Southeast Texas. According to a state tally, all 51 school districts across the Houston area have postponed the start of classes until next Tuesday, affecting more than 1 million students, as they figure out how their infrastructure will recover from the unprecedented volume of water now blocking highways and destroying homes. More than 200 school districts experienced delays due to the storm, by the state's estimated count. Those ranged from a couple of hours in nearly 10 Central Texas districts to indefinite closures in four smaller school districts farther south on the Gulf Coast. With coastal schools sustaining major physical damage and Houston-area and eastern Texas schools bracing for another blow from Harvey this week, no one knows when students will be able to start classes again. In the meantime, school buildings that weathered early parts of the storm are being put to use. The American Red Cross is using the Aldine ISD's M.O. Campbell Center, just north of Houston, to provide shelter for people displaced by flooding. Normally a multipurpose facility hosting graduations and banquets, the center is now a temporary home for about 1,400 people, Bamberg said. Aldine ISD cafeterias were already stocked with food this week, awaiting tens of thousands of students expected to start their second week of school. Teachers and administrators are lending helping hands, making sandwiches and carting supplies. Bamberg estimated that water seeped into about five of Aldine's buildings, leaving them with minor damage. But no one knows when the floodwater will recede. "You have to think about not only whether your kids will be able to make it, but also will you have your staff members able to come in and work?" she said. After brainstorming internally and with various school districts earlier in the week, the Texas Education Agency on Tuesday published a basic list of resources and guidelines for school officials working to manage the displacement of families and rebuild their classrooms in the 58 counties cited in Gov. Greg Abbott’s disaster proclamation. It will also provide waivers for school districts in those counties that were forced to cancel classes so they do not have to make up those days on the calendar. "We're doing our best to get as much out there that is as certain as possible, but it is a fluid situation," said Lauren Callahan, agency spokeswoman. Agency officials hope to have a better idea next week of when schools hit by the disaster will be able to start running, dealing with the long-term damage on a "case-by-case” basis. School districts are continually providing updated information to families through social media. The Texas Department of Agriculture issued a release Tuesday pledging to allow schools to feed any students affected by the hurricane for free. Houston ISD received approval to give all of its students three free meals per day throughout the school year. “This waiver will give our families one less concern as they begin the process of restoring their lives. It will also provide a sense of normalcy by allowing students to have access to up to three nutritious meals each and every school day,” said Superintendent Richard Carranza in a release Wednesday. Cypress-Fairbanks ISD Superintendent Mark Henry estimated that 10 to 12 of the district's buildings have suffered significant water damage. Unable to physically survey some of the buildings, officials are using their camera systems to assess the damage. “We expect when this is all said and done, this will be a multimillion-dollar damage claim to our facilities,” he said. The district’s Berry Educational Support Center, about 30 miles northwest of Houston, opened Monday to provide temporary shelter for people waiting to be evacuated. The 9,000-seat sports arena and conference center has a commercial kitchen on-site, as well as several bathrooms and showers. The food that was supposed to be sold at the concession stand in the football stadium is now feeding those fleeing the storm. Local officials are using Cypress-Fairbanks ISD school buses to transport people to shelters. Individuals and organizations donated cots and blankets for people to sleep on. Henry said it’s important to get kids back into a school routine as soon as possible, but he doesn’t know if classes will start again next Tuesday as currently scheduled. Schools in Houston ISD also opened to help displaced families over the weekend, but the city shut them down by Monday because of safety concerns. In Klein ISD, 30 miles north of Houston, pens used for livestock shows in the multipurpose center now serve as temporary homes for dozens of pets accompanying their owners out of the brunt of the storm. Continued flooding Monday night resulted in another round of evacuations, so district officials opened Klein Oak High School. They put more than 250 inflatable mattresses in the two competition gymnasiums attached to the high school, turned the office space into a command center, started a nurse's clinic in one section, and provided four computers for people to fill out their disaster assistance paperwork, according to Thomas Hensley, principal of the high school. "All day long, people have shown up in droves, saying, 'What can I do? Give me anything. How can I help?'" he said. “Being able to run a shelter right here in part of our community as part of the community has been, honestly, it’s been heartbreaking. These are people we teach. These are people we teach with,” said Superintendent Bret Champion. District officials are in communication through social media and phone calls with parents and students, and with other school districts, to figure out each step. Though Klein ISD schools are scheduled to open next Tuesday, they realistically will open whenever it’s safe again for people to travel through their communities. “Every kid and employee will be walking into a safe environment in Klein ISD when we make the decision to open,” Champion said. Harvey delays opening of many Texas schools; some become shelters By Aliyya Swaby August 29, 2017 Editor's note: This story has been updated to note that Houston ISD has gotten approval to provide its students with three free meals a day for the 2017-18 school year. Last Thursday, Superintendent Wanda Bamberg honored Aldine ISD students who took extra classes this summer to graduate. The next morning, she and her teachers were putting library books on higher shelves, where they would be less likely to be inundated by flooding. "We were celebrating for the kids Thursday and then trying to protect the rest of them on Friday," she said. Instead of overseeing the Houston-area school district this week, Bamberg is helping oversee relief efforts at two Aldine ISD buildings being used to shelter evacuees as Hurricane Harvey continues to flood Southeast Texas. According to a state tally, all 51 school districts across the Houston area have postponed the start of classes until next Tuesday, affecting more than 1 million students, as they figure out how their infrastructure will recover from the unprecedented volume of water now blocking highways and destroying homes. More than 200 school districts experienced delays due to the storm, by the state's estimated count. Those ranged from a couple of hours in nearly 10 Central Texas districts to indefinite closures in four smaller school districts farther south on the Gulf Coast. With coastal schools sustaining major physical damage and Houston-area and eastern Texas schools bracing for another blow from Harvey this week, no one knows when students will be able to start classes again. In the meantime, school buildings that weathered early parts of the storm are being put to use. The American Red Cross is using the Aldine ISD's M.O. Campbell Center, just north of Houston, to provide shelter for people displaced by flooding. Normally a multipurpose facility hosting graduations and banquets, the center is now a temporary home for about 1,400 people, Bamberg said. Aldine ISD cafeterias were already stocked with food this week, awaiting tens of thousands of students expected to start their second week of school. Teachers and administrators are lending helping hands, making sandwiches and carting supplies. Bamberg estimated that water seeped into about five of Aldine's buildings, leaving them with minor damage. But no one knows when the floodwater will recede. "You have to think about not only whether your kids will be able to make it, but also will you have your staff members able to come in and work?" she said. After brainstorming internally and with various school districts earlier in the week, the Texas Education Agency on Tuesday published a basic list of resources and guidelines for school officials working to manage the displacement of families and rebuild their classrooms in the 58 counties cited in Gov. Greg Abbott’s disaster proclamation. It will also provide waivers for school districts in those counties that were forced to cancel classes so they do not have to make up those days on the calendar. "We're doing our best to get as much out there that is as certain as possible, but it is a fluid situation," said Lauren Callahan, agency spokeswoman. Agency officials hope to have a better idea next week of when schools hit by the disaster will be able to start running, dealing with the long-term damage on a "case-by-case” basis.&nbsp; School districts are continually providing updated information to families through social media. The Texas Department of Agriculture issued a release Tuesday pledging to allow schools to feed any students affected by the hurricane for free. Houston ISD received approval to give all of its students three free meals per day throughout the school year. “This waiver will give our families one less concern as they begin the process of restoring their lives. It will also provide a sense of normalcy by allowing students to have access to up to three nutritious meals each and every school day,” said Superintendent Richard Carranza in a release Wednesday. 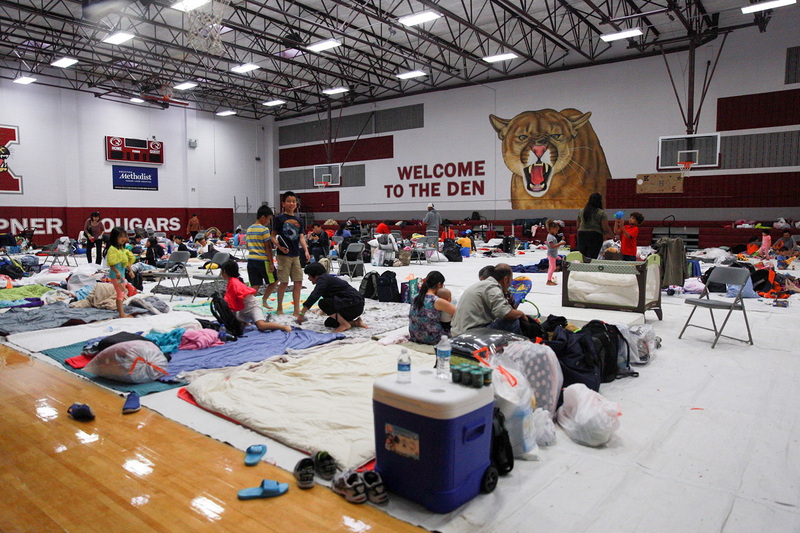 The gym at Kempner High School in Sugarland in Fort Bend Co. southwest of Houston has been converted to a shelter. Pu Ying Huang for The Texas Tribune Cypress-Fairbanks ISD Superintendent Mark Henry estimated that 10 to 12 of the district's buildings have suffered significant water damage. Unable to physically survey some of the buildings, officials are using their camera systems to assess the damage. “We expect when this is all said and done, this will be a multimillion-dollar damage claim to our facilities,” he said. The district’s Berry Educational Support Center, about 30 miles northwest of Houston, opened Monday to provide temporary shelter for people waiting to be evacuated. The 9,000-seat sports arena and conference center has a commercial kitchen on-site, as well as several bathrooms and showers. The food that was supposed to be sold at the concession stand in the football stadium is now feeding those fleeing the storm. Local officials are using Cypress-Fairbanks ISD school buses to transport people to shelters. Individuals and organizations donated cots and blankets for people to sleep on. Henry said it’s important to get kids back into a school routine as soon as possible, but he doesn’t know if classes will start again next Tuesday as currently scheduled. “We’ve lost students at least temporarily to Dallas and Austin and other places,” he said. “We want to get up and running as soon as possible. I wish I could say what date.” He wishes he had been more prepared for a potential 50 inches of rain. He would have asked for donations earlier and made different decisions about which facilities to open for shelter. “Moving forward, we’re going to make a disaster plan for something as traumatic as this one,” he said. “If we plan for something like this, I think everything else will seem minor.” Schools in Houston ISD also opened to help displaced families over the weekend, but the city shut them down by Monday because of safety concerns. In Klein ISD, 30 miles north of Houston, pens used for livestock shows in the multipurpose center now serve as temporary homes for dozens of pets accompanying their owners out of the brunt of the storm. Continued flooding Monday night resulted in another round of evacuations, so district officials opened Klein Oak High School. They put more than 250 inflatable mattresses in the two competition gymnasiums attached to the high school, turned the office space into a command center, started a nurse's clinic in one section, and provided four computers for people to fill out their disaster assistance paperwork, according to Thomas Hensley, principal of the high school. "All day long, people have shown up in droves, saying, 'What can I do? Give me anything. How can I help?'" he said. “Being able to run a shelter right here in part of our community as part of the community has been, honestly, it’s been heartbreaking. These are people we teach. These are people we teach with,” said Superintendent Bret Champion. District officials are in communication through social media and phone calls with parents and students, and with other school districts, to figure out each step. Though Klein ISD schools are scheduled to open next Tuesday, they realistically will open whenever it’s safe again for people to travel through their communities.&nbsp; “Every kid and employee will be walking into a safe environment in Klein ISD when we make the decision to open,” Champion said. Read related Tribune coverage Slideshow: Scenes from Hurricane Harvey Why Houston's reservoirs aren't likely to fail after Hurricane Harvey Five days after Hurricane Harvey, here's where things stand in Texas "Harvey delays opening of many Texas schools; some become shelters" was first published at by The Texas Tribune, a nonprofit, nonpartisan media organization that informs Texans — and engages with them — about public policy, politics, government and statewide issues. Link back to the original article, which is located at https://www.texastribune.org/2017/08/29/classes-hold-texas-schools-become-shelters-during-harvey-flood/.